Men are in need of feminine power as much as women are. The idea that female empowerment somehow lessens or dominates male power is a falsehood. Again and again, in religious iconogaphy throughout history, we see the male child on the lap of the Divine Mother. Heru on the lap of Auset, Krishna on the lap of Yeshoda, Christ on the lap of Mother Mary. She nurtures, heals an suckles him. One can look at the story of Ma Tara and Lord Shiva. To save the word from the vile poisons created during the churning of the waters of creation, Shiva drinks the poison... taking this vile substance upon himself. By the immensity of this poison Shiva is struck unconscious. Mother appears as Tara, suckling Shiva at her breast--Her milk rendering the poison inert. ​We are waking now from the dream of female subjugation and voluntary submission. For order, peace and Truth to flourish on this Earth, feminine power must take its rightful place. In darshan I was blessed to see Mother Mary annointing the head of Christ. The holy child walked toward a great sea which was filled and contaminated by great evil. 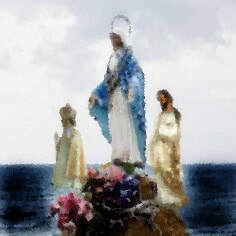 At the water's edge, Mother Mary lowered her hand into the water, which was filled with the demonic forms and their essence. She takes this water, raises it up in her hands and pours this over the head of her child equipping him for the battle. His work may be a literal or figurative battle, in either case he is prepared for it and ultimatley suckled and healed by the Divine Feminine. These are Her waters. Birth and manifestation are Her power. Together, the masculine and feminine preserve creation in its ideal form. To baptize in water is the birthright of every woman. We are vested with this authority as emanations of the Mother of All. The waters within our wombs carry our intentions, cradling the child for 9 months. After birth, we go to a natural water source to annoint the child's head with waters from the womb of the Mother of All so that our intention is always in alighment with the highest good. ​Gather your water pots, prepare your vessels we are returning to our way.